Of course we’re more interested in the amount of money we’re carrying around in our wallet than the wallet itself. Without giving it much thought we just may choose easy to use and practical. Who needs style in a wallet? Who cares about making a fashion statement? Well, the question really should be, why not stand out? Why not have something special? And there are some options to choose from that provide exactly that. But first things first, your wallet does need to hold your ID cards, your credit cards, your money and maybe a picture of your family. Everything should be easily accessible and handy to get at. But beyond these requirements there is no reason it can’t be a fashion accessory. We’re always getting it out every time we pay for something so why not make an impression? Let your wallet speak for you. Sporty Wallets – They’re usually less expensive than their leather counterparts and made from lightweight materials like nylon, vinyl, twill or even rubber. If they’re meant for really casual use they may even close using Velcro which adds to the sporty look. These wallets are sturdy and often waterproof but they lack style and any appeal in terms of fashion. Classy Wallets – Leather wallets definitely have more class. There are many different styles and a lot of variety in terms of the quality of the leather. Bi-folds are very popular for everyday use. Those that carry a lot of business and/or credit cards would probably be better served with a tri-fold. Basic cow leather is most commonly used and the most affordable. If you want a more exotic look you might choose something made of lizard or crocodile. There are also wallets made of shark skin and stingray. These are more expensive but may be well worth it as they have a very distinctive appeal. If you really want to make an impression you might want to pop for a wallet made of ostrich leather. It screams money and in fact is very expensive. It may be ostentatious but if you can carry it off, why not? If you’re choosing a wallet for someone as a gift you should really take your time and give it some thought. A wallet should fit the user’s personality. You wouldn’t expect Kanye West to carry a nylon wallet with Velcro would you? If your dad loves to go fishing he might love a shark skin wallet. It’s great looking and surprisingly durable, much more so than cow leather. He’ll love it and be able to use it the rest of his life. For someone a little more formal, stingray leather may be just the thing. Stingray has a shiny appearance and is perfect for someone who dresses well and presents a polished appearance. There are a lot of fake leather wallets out there so you’ve got to take a really close look before you buy. Sniff it because it should smell of leather. Make sure the grain isn’t just embossed on and that it’s real leather. A nice leather wallet will have even, tight stitching so take a close look at that too. It’s better to be safe than sorry so just to be sure, pull bills and cards from your wallet to make sure they fit easily into the new one. Last but not least, if you really want something very special and totally unique give our wallets a look. 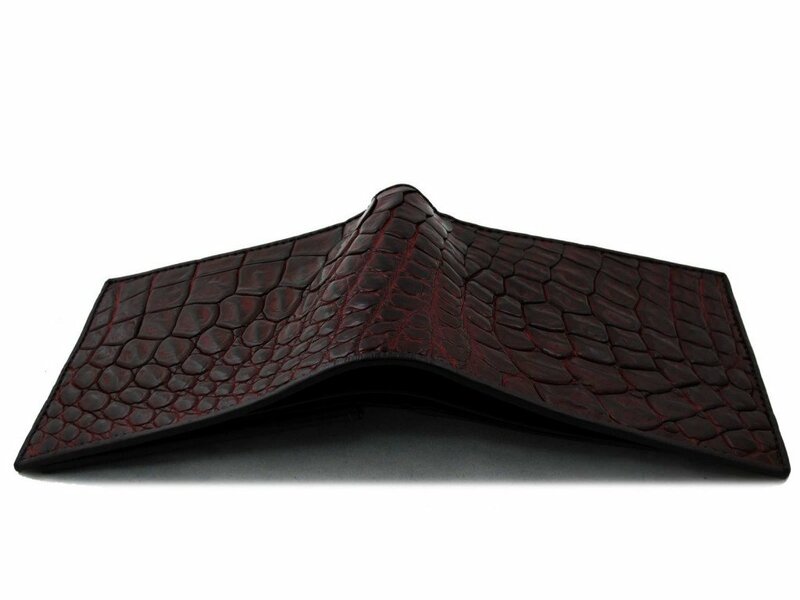 Nothing we sell has been mass produced and our wallets are made of beautiful exotic leathers.